A doctor saves a Douglas Cardinal home from being torn down, and restores it to its former glory. Celebrated architect Douglas Cardinal chuckles now as he remembers, decades ago, sitting in the living room of his friends’ home, John and Helen Grotski. “There would always be cars driving by, and then you’d hear a screech of the tires as they’d back up, stop and look at the house,” says Cardinal. In 1978, he’d taken the Grotskis’ 1959-built, 1,200-square-foot bungalow, a house very typical of the Capilano neighbourhood, and turned it into an architectural masterpiece. It was just supposed to be a kitchen renovation, but it became a re-imagining of a typical bungalow’s potential. Passersby were treated to a unique and rare view of Cardinal’s residential design esthetic: West Coast Post-and-Beam construction, floor-to-ceiling windows set in industrial bronze-anodized aluminum frames, a brick-clad chimney that sloped up to an arched flue. It was the kind of house that commanded attention, screeching tires and all. 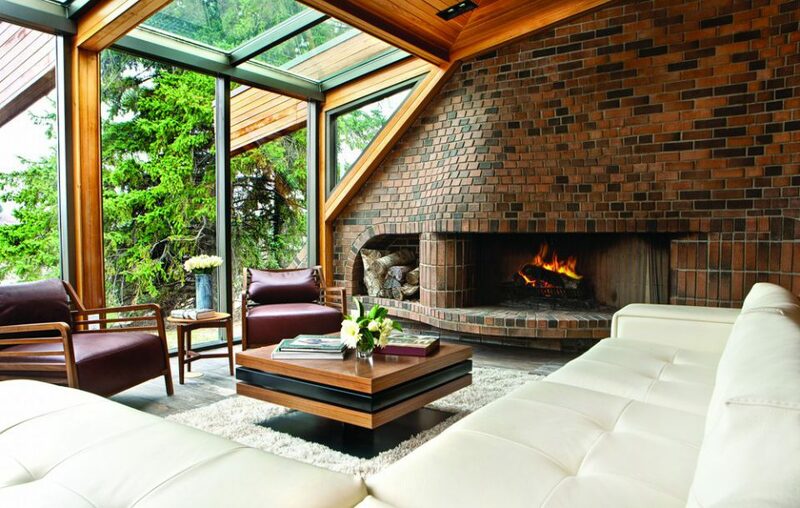 To preserve the architect’s unique brick fireplace, the designer sourced subtle Italian travertine stone tiles that complemented, rather than competed with it. Fast-forward 34 years. Dr. Nan Schuurmans stands in the very same living room, pointing to the organic, curvilinear, natural brick fireplace, the architectural hint that sold her on the Capilano Crescent home the moment she entered it in 2010. “I really love the way he thinks about having a building fit in with its natural environment – not having it stick out, but almost become part of its surroundings,” says Schuurmans, an obstetrician. It was a twist of fate. She wasn’t actively looking to purchase a home, but a friend of hers saw the “For Sale” sign go up and called her immediately. The house was listed as a possible teardown in 2010 with a price tag of $889,500. The bricks on the chimney were crumbling, the cedar cladding on the exterior beams were severely weathered and the interior was dated. Schuurmans took one step inside and recognized the cultural and architectural significance of the “Grotski home,” and set in motion a restoration that would respect the integrity of Cardinal’s design, while breathing modern life into the aging house. “This house gives me a sense of history,” says Schuurmans. “I think it’s important to preserve homes, especially beautiful ones, as examples of a different time.” Through her efforts, Edmonton City Council designated the house a municipal historic site in February of 2011. Schuurmans hired architect David Murray and interior designer Fay Mihailides to help with the restoration. Murray, who interned with Cardinal in the early ’70s, oversaw the exterior restoration. “The fireplace itself was in good condition, but the exterior chimney had deteriorated sufficiently that it needed to be completely rebuilt,” says Murray, adding that most of the cedar cladding was refurbished and refinished to its original appearance. Schuurmans’ art collection includes two Linus Woods paintings. The floor in the front entrance had extensive damage, according to Mihailides. And, though Rescom Inc. contractors carefully removed, scraped, counted and stacked each brick tile, there weren’t enough salvageable tiles to re-use in the front entrance and living room. Mihailides sourced subtle Italian travertine stone tiles that complemented, rather than competed with, the swell of the unique brick fireplace. Mihailides also had the closet doors that once faced the front entrance moved into the office directly behind the closet, so she could create a wall space for Schuurmans to display her impressive art and sculpture collection. And, glass panels that once split the entrance from the living room were completely removed. “The whole house is organic, and it’s about flow, so we’ve really just tried to recreate that,” says Mihailides. Except for a few new window panels and the travertine tile that replaced the aging cream-coloured carpet, the living room was left untouched. A few tiles on the fireplace were repaired, and the metal railing that separated the living room and dining room was repainted. The curved island pays homage to Cardinal’s curvilinear esthetic. The kitchen went through a near complete overhaul. The dated yellow-oak cabinets that cut off the kitchen from the rest of the house were replaced with modern grey-stained oak Pedini cabinets. The curved island pays homage to Cardinal’s curvilinear esthetic, says Schuurmans. No matter what direction she faces when standing in the kitchen, she has window views to her outside natural surroundings, another nod to Cardinal’s design philosophy of seamlessness between the indoors and outdoors. A drop-down ceiling was also removed to further open and brighten the kitchen. Lighting the space was a challenge because there wasn’t enough room in the ceiling to add potlights, and the ceiling is angled, but Mihailides found spotlights on a round frame that could be incorporated. The master suite was also upgraded. A walk-in closet and secret room called a Habitat (a pod-like space complete with an 8-track player, built-in speakers and skylight) were both opened up to create a corridor that runs alongside the master bath and into the bedroom. The deteriorating travertine tile slabs in the shower were cut down to smaller, rectangular tiles, then fitted into a new stall. Mihailides says the walls were kept at the datum line to create a sense of openness and to maintain a visual of the windows in the bathroom, even from the bedroom. “The architecture is always prevalent, in every direction,” says Mihilaides. Schuurmans finally moved into her home last December, but there are still areas of the house that she’d like to restore. For now, she’s ecstatic about the space, and says she’s had her share of screeching tires as well. The project (completed in 1968) that propelled the architect was true to his organic design philosophy, emulating the flow and sweeping lines of the prairie landscape. He received several awards. Built in 1976, it’s considered Cardinal’s first major building project, though he says that the size of a project means little to him. “It’s really more about working with people who want a creative and imaginative project, whether it’s a house or a building.” He also designed the college’s performing arts centre named after him. The first of his architectural projects designed entirely on a computer, St. Albert Place, completed in 1983 continued to show the evolution of his trademark curvilinear motif. A year later, he added The Arden to its body and, in 2009, the City of St. Albert designated it a historic building. Previously the Edmonton Space Sciences Centre, this iconic building for space-age educational facility and all-things science opened in 1984. This 1989 museum was the project that took the Calgary-born architect to Ottawa, where he remains. But, he says, his heart remains in Alberta. In 1998, Cardinal designed this five-storey, $219 million building on Washington, D.C.’s Mall. It opened in 2004 to house over 800,000 native cultural artifacts in 250,000-sq.-ft. of space.